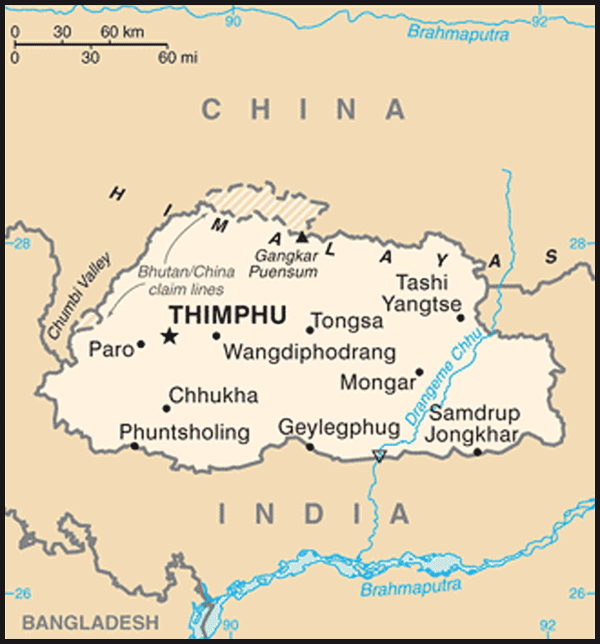 Cities: Capital — Thimphu (pop. approx. 55,000) Other significant cities — Paro, Phoentsholing, Punakha, Bumthong. Nationality: Noun and adjective — Bhutanese. Annual population growth rate (2007 est. ): 2.082%. Density — 45 per sq. km. Education: Years compulsory: 11. Literacy — 59.5% (Ministry of Education General Statistics 2007). Primary school net enrollment rate 82.1% (UNDP). Women's literacy — 59.5% (2007). Health: Infant mortality rate (2007 est. ): total: 96.37 deaths/1,000 live births; male: 94.09 deaths/1,000 live births; female: 98.77 deaths/1,000 live births. Life expectancy — total population 67 years; male 69.1 years; female 59.5 years (Ministry of Education General Statistics 2007). Work force (2005): Agriculture: 94%; industry — 1%; services — 5%. The unemployment rate is 3.1% (2005 est.). Branches: Executive: prime minister, cabinet. Legislative — parliament (National Council and National Assembly). The king appoints five members of the National Council and the remaining members are elected. Elections for the National Council (upper house) took place in December 2007. The 47-member National Assembly (lower house) was elected in March 2008. Judicial — High Court (Thrimkhang Gogma), District Courts, and local area arbitration. Sectors as percent of GDP (all figures, 2006-2007): Agriculture — 22.3%; industry — 37.9%; services — 39.8%. Trade: Principal exports (2006-2007): electricity 26.5%, recorded media 16.8%, palm oil 7.4%, copper wire 6.2%. Principal imports (2006-2007) — diesel fuel 7.9%, copper wires 7.3%, crude palm oil 5.5%, petrol 3.1%. Major trade partners — India, Hong Kong, Japan, Germany, Singapore, and Thailand. The people of Bhutan can be divided into three broad ethnic categories — Ngalops, Sharchops, and Lhotsampas. The Ngalops make up the majority of the population, living mostly in the western and central areas. The Ngalops are thought to be of Tibetan origin, arriving in Bhutan during the 8th and 9th centuries A.D. and bringing Buddhism with them. Most Ngalops follow the Drukpa Kagyupa discipline of Mahayana Buddhism. In a country that is deeply rooted within the Buddhist religion, many people's sect of religion, as opposed to their ethnic group, characterizes them. The Ngalops predominate in the government, and the civil service and their cultural norms have been declared by the monarchy to be the standard for all citizens. Migration by Nepalis into southern Bhutan began in the early 19th century. Currently these and other ethnic Nepalis, referred to as Lhotsampas, comprise 35% of Bhutan's population. 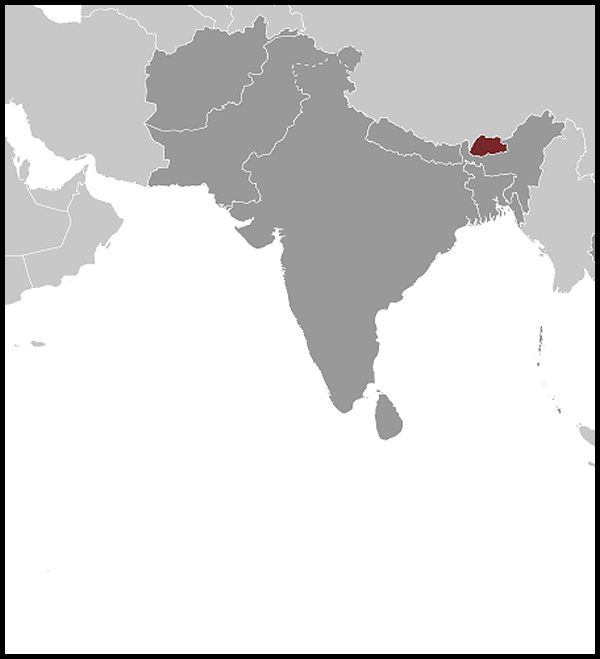 In 1988, the government census led to the branding of many ethnic Nepalis as illegal immigrants. Local Lhotshampa leaders responded with anti-government rallies demanding citizenship and attacks against government institutions. Between 1988-1993, thousands of ethnic Nepalis fled to refugee camps in Nepal alleging ethnic and political repression. As of January 20, 2010, 85,544 refugees resided in seven camps. Bhutan and Nepal have been working for over seven years to resolve the refugee problem and repatriate certain refugees living in Nepal. The resettlement of Bhutanese refugees from the camps in Nepal to the U.S., Australia, and New Zealand is proceeding, with over 26,000 refugees repatriated to third countries (over 23,000 are now settled in the U.S.). The transition to democracy may improve the situation: of its 47 candidates, the DPT fielded nine Nepali speakers. Officials from both the DPT and PDP have said that resolving the grievances of ethnic Nepalis is a priority. The spiritual head of Bhutan, the Je Khempo — the only person besides the king who wears the saffron scarf, an honor denoting his authority over all religious institutions — is nominated by monastic leaders and appointed by the king. The Monk Body is involved in advising the government on many levels. The economy, one of the world's smallest and least developed, is based on hydroelectricity, tourism, agriculture, and forestry. Rugged terrain makes it difficult to develop roads and other infrastructure. Despite this constraint, hydroelectricity and construction continue to be the two major industries of growth for the country. As these two economic sectors contribute to increased productivity, Bhutan's development prospects are positive. The Tala hydroelectric project, completed March 2007, has bolstered government revenue and exports, and will continue to do so for the next several years. In late 2009, Bhutan signed four memoranda of understanding (MOUs) with India to prepare four additional hydroelectric projects in Bhutan. Bhutan's tenth five-year plan (2008-2013) focuses on ways to manage the country's new-found wealth with special emphasis on three development areas: rural, regional, and private-sector. India has pledged to support the plan and promised to double the amount of aid given to Bhutan in the previous five-year plan. The parliament had not yet finalized the tenth five-year plan as of October 2008; it intended to do so during the next session later in 2008. India is Bhutan's largest trade and development partner, providing significant amounts of foreign aid and investment. Traditionally, the 1949 Treaty of Peace and Friendship governed relations between the countries. In February 2007, India and Bhutan signed a new treaty removing the clause that India will "guide" Bhutan's foreign policy and allowing Bhutan to purchase military equipment from other countries. However, bilateral ties remain close, demonstrated by Indian Prime Minister Manmohan Singh's May 2008 visit to Thimpu during which he addressed the newly elected parliament. Prime Minister Jigme Thinley returned the gesture when he made his first official trip abroad as prime minister to New Delhi in July 2008; King Jigme Khesar Namgyel Wangchuck also visited India in December 2009. Bhutan and China do not have diplomatic relations, although they have engaged in 19 rounds of high-level talks regarding a border dispute over three Chinese-built roads which the Bhutanese Government alleges encroach on its territory. Although the current official trade between the countries is minimal, the Chinese Government announced that trade had increased by 3,000% from 2006 to 2007. Bhutan and Nepal established diplomatic relations in 1983 and are still negotiating a solution to a protracted refugee situation, in which over 85,000 refugees reside in seven UNHCR camps in Nepal. Most of the refugees claim Bhutanese citizenship, while Bhutan alleges that they are non-nationals or "voluntary emigrants," who forfeited their citizenship rights. In 2003, a joint Bhutan-Nepal verification team categorized refugees from one camp into four groups, but progress remains stalled. Out of these refugee camps have arisen several insurgent groups, such as the Bhutan Communist Party (Marxist-Leninist-Maoist), the Bhutan Tiger Force, and the United Revolutionary Front of Bhutan. Bhutanese security forces blamed these groups for a series of bombings targeting the country in the lead-up to the 2008 parliamentary elections. The U.S. Embassy in New Delhi, India, has consular responsibilities for Bhutan, but U.S. citizens also may request assistance from U.S. Embassies in Kathmandu, Nepal, or Dhaka, Bangladesh. The United States and Bhutan do not have diplomatic relations, and the United States does not give foreign assistance to Bhutan. Informal contact is maintained through the U.S. Embassy and the Bhutanese Embassy in New Delhi. Bhutan does participate in a regional program for South Asia sponsored by the U.S. Agency for International Development (USAID) that helps countries develop their power infrastructure (SARI-E). A few Bhutanese military officers have attended courses at the Asia-Pacific Center for Security Studies. The U.S. Government annually brings several Bhutanese participants to United States through its International Visitors and Fulbright Programs.